Many career-oriented women say they would like to work part-time, especially after having a baby, but given our fast-paced and busy lives, is it really realistic? I say yes. Most women with experience in a professional occupation or high-tech career can quit a full-time job to go out on their own. In as little as two years, you can build a part-time business, in order to have a more flexible and satisfying life. I've been a woman of leisure (read: unemployed) for several months now and, frankly, it doesn't suit me. I'm a high energy/high action person and being sidelined has been frustrating. My frustration peaked recently while working on an exercise in the Reach Branding Club curriculum. A former Inc. 500 marketer, my objective was to reposition my brand to transition back into software marketing after five years in technology sales. The rebranding process consisted of two primary phases: brand development and brand communication. From a communications standpoint, my objective was to establish an online presence to differentiate myself from my competition and extend my reach beyond Southern California. Seeking High Technology and Life Sciences Entrepreneurs! Are you an emerging growth high technology or life sciences company seeking equity funding for your company? 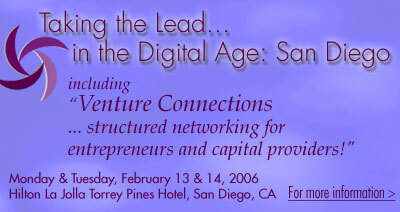 If so, apply to present your company at Venture Connections, an invitation only, venture conference being held in San Diego, California, on Monday, February 13, 2006. Venture Connections is an invitation only, separate track of the Technology Summit. It features structured networking between entrepreneurs in technology and life sciences companies and capital providers (venture capitalists, angel investors, private equity funds and other capital providers representing billions of available financing), in one room! It would take months of meetings and a gold-plated rolodex to match the breadth and depth of financing options available in one room at the Technology Summit! Entrepreneurs (women and men) who are founders or CEO's of high technology and life sciences companies that are currently seeking additional rounds of financing are encouraged to apply to participate in Venture Connections. Applicant companies will be asked to submit an executive summary for consideration and review. If approved, the applicant company will be asked to submit a full business plan. For more information or to submit an application: www.witi.com/sdvc, or contact: Jennifer Beckey, tel: 858.344.3825, or email: [email protected]. Have your New Year's resolutions truly impacted your life, or are they now just a distant memory? After the holidays, did your everyday life get in the way? Did you plan to lose weight, start a fitness program, or quit smoking? It's hard to stick with large, audacious goals day-by-day. Perhaps you can think in terms of "Total Health," and take baby steps to get there. Each day, do something for your health, and by the end of the year, you will have made a major overall impact. The disconnect theory was first coined by Charles Wang in his book Techno-Vision. The nineties were filled with studies purporting strategic alignment. The CEO and CIO have to be on the same page. Information technology is a support function of the business and should not be perceived as just a cost center. CIOs were to join ranks of the other C level executives in the high level organizational strategic planning sessions. But around 1998 the disconnect disappears from the literature. The hot topics are eCommerce and the dotcoms. But did the disconnect disappear with the absence of reference in the literature? This research study will examine whether or not the disconnect still exists using Dr. Jerry Luftman's Strategic Alignment Maturity Assessment model. To participate in this survey, please visit http://www.zoomerang.com/survey.zgi?p=WEB224WHQS7XT8. The survey is completely anonymous. Priya Sarathy, current director of WITI's Atlanta Network, has taken up the position of a Senior Analytic Strategist with IBM's Marketing Intelligence Center for Excellence. Priya, an analytic director at Epsilon (one of the top 5 marketing consultancy, currently a subsidiary of Alliance Data Systems) will be supporting and implement the vision of IBM's newly established Center of Excellence for Market Data Analytics. She will be providing thought leadership towards the global integration of analytic initiatives across Brand, Customer segments, and Geography for IBM. In her new role, Priya will be responsible for managing IBM's internal sponsor relationship to influence and integrate sponsor strategies to achieve the vision of the Center of Excellence for global integration. She has experience working with AT&T's International forecasting team and Prospect Acquisition teams and rich consulting experience with Technology and Telecom clients like IBM, BMC Software and Verizon Wireless. 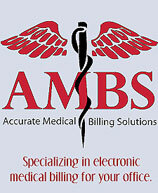 Accurate Medical Billing Solutions, specializes in electronic medical billing for your office. We offer our clients fast, efficient, secure electronic medical billing with a personal touch. Our solution will give you the ease of mind that your business is getting the personal and professional attention that it deserves. Let us provide you with exceptional billing services and take the worry out of your hands while increasing your office profits. Payments sent directly to your office in 5-7days. Dedicate more time to your patients. WITI invites you to attend the Small Business Summit 2006! The Summit is for small business owners seeking growth through the marriage of best business practices and technology. Attend and strengthen your competitive edge and make your business soar, by successfully applying the right technology to support the right business practices. This full-day conference, with a unique interactive structure, will provide answers to help you with your specific business situation. The first 20 WITI readers to register get complimentary tickets! Use promo code: WITI. Visit http://www.smallbiztechsummit.com. See you at the Summit! Does your company have high growth potential and need a large amount of capital to realize this growth? Have you always wondered whether venture capital could be for you? If you have answered yes to both these questions, then you are the right candidate for VC 101. VC 101 is a comprehensive course that helps entrepreneurs determine whether their business opportunity is venture-fundable or not. It is being run by CWE, the organizer of the only venture capital forum for women-led businesses in New England for the past 6 years. VC 101 will be taught by investors from top VC firms, by women entrepreneurs, and by other members of the community who have contributed to the success of CWE's Venture Capital Program. They have had years of experience investing in, running, or working with high-growth businesses. VC 101 will help you determine whether venture capital is for you, know how to access equity capital, and present your business opportunity in a compelling way to potential investors, whether individuals or institutions. For those who are interested to apply or those who have questions, please contact Ella Aglipay at [email protected]. There are only 12 slots for the course. Accepted participants will be charged a course fee of $800. VC 101 classes will be every Wednesday, March 15-May 17, 6-8pm, at CWE Boston Office, 24 School Street, 7th Floor. Participants will be accepted on a rolling admissions basis starting February 8th, so submit your applications as soon as possible!